Ballantyne, Andrew, and Chris L. Smith, eds., Architecture in the Space of Flows. London: Routledge, 2012. Nixon, Rob. Slow Violence and the Environmentalism of the Poor. Cambridge MA: Harvard University Press, 2013. Star, Susan Leigh, and James R. Griesemer. ‘Institutional Ecology, “Translations” and Boundary Objects: Amateurs and Professionals in Berkeley’s Museum of Vertebrate Zoology, 1907–39.’ Social Studies of Science, 9, no. 3 (August 1989): 378-420. Zook, Matthew. and Mark Graham. ‘Wal-Mart Nation: Mapping the Reach of a Retail Colossus,’ in Wal-Mart World: The World’s Biggest Corporation in the Global Economy, ed. Stanley D. Brunn, 15-27. London: Routledge, 2006. Jesse LeCavalier’s work explores the architectural and urban implications of contemporary logistics. He is the author of The Rule of Logistics: Walmart and the Architecture of Fulfillment (University of Minnesota Press, 2016) and an associate professor of architecture at the New Jersey Institute of Technology. He is currently the Daniel Rose Visiting Assistant Professor at the Yale School of Architecture. LeCavalier was the recipient of the 2015 New Faculty Teaching Award from the Association of the Collegiate Schools of Architecture (ACSA) and the 2010–11 Sanders Fellow at the University of Michigan. His work has appeared in Cabinet, Public Culture, Places, Art Papers, and Harvard Design Magazine. His installation ‘Architectures of Fulfillment’ was part of the 2017 Seoul Biennale for Architecture and Urbanism as his project ‘Shelf Life’ was one of five finalists for the 2018 MoMA PS1 Young Architects Program. LECAVALIER, Jesse. New Interfaces in the Automated Landscapes of Logistics. FOOTPRINT, [S.l. ], p. 105-114, nov. 2018. ISSN 1875-1490. Available at: <https://journals.open.tudelft.nl/index.php/footprint/article/view/2217>. Date accessed: 21 apr. 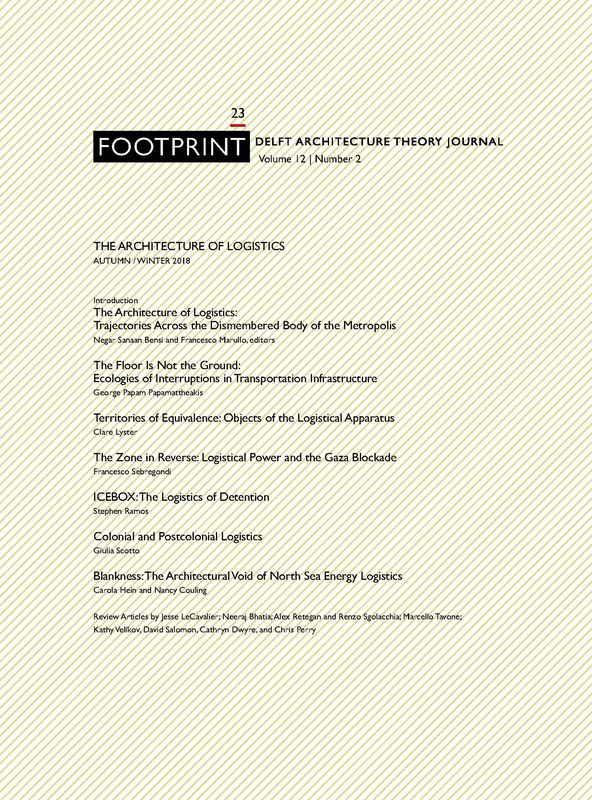 2019. doi: https://doi.org/10.7480/footprint.12.2.2217.